So many times over my homeschooling years, I focused on creating our learning space- the homeschool room. It was hard not to focus on it because I would see all these pictures floating around cyberspace of beautiful rooms that screamed success! The rooms matched and were warm and inviting. I assumed kids must be doing lots of learning in those rooms! They were perfect. Over the years, I have come to realize, while a beautiful room is certainly a blessing, it is not a necessity for learning to take place. Learning has taken place in our home in many different rooms–there has probably been a lesson learned in some way in every room! Learning has taken place many, many times outdoors. God teaches us so much about Himself through nature, and we revel in the majesty of nature daily, and in each season. Right now learning is taking place, on our ever expanding mini farm here in our little slice of the world. I recently wrote in my new book, Real Homeschool: Letting Go of the Pinterest-Perfect and Instagram-Ideal Homeschool about the one year that we learned so much and I learned to prioritize. My husband had been laid off from his job, and we didn’t have the option to buy extras. We didn’t have the option for fancy decor. We didn’t have the option for searching Pinterest to recreate those beautiful pictures. Our finances were tight and I knew we had to work with the bare minimum. And you know what? Without those distractions, I saw so much more clearly my purpose in all of this. My purpose is not to provide the best looking room, with matching decor and neatly lined shelves. My purpose isn’t about searching the internet for more ideas on how to make things look perfect. My purpose is to raise my children in the Lord, and the circumstances around me or the school room do not define success. Without the distractions of trying to purchase extra “stuff” for our classroom, we had the most simple year, but the most successful. That was the year we used the Bibe as our main textbook as well. It was a fabulous year. Yup. a fabulous year. When the budget didn’t allow for extras, and we just had the Bible, the library, and each other….we learned. We learned from life (and boy when Daddy is out of work and you are making major life decisions, there are certainly many lessons!). Remember, the homeschool learning space is life all around you. Even if you have the option to make it beautiful, if you find you are focusing more on how things look, than on how things are going on the inside, take a break. What we teach our kids matters- and if we are modeling to them our priorities, those are going to be what they will remember. If our priority is teaching His Word, and living a life that honors Him above all, we will be successful in whatever else we teach, fancy homeschool room or not. It is not where you learn necessarily, but what you learn. To read more, grab my new book Real Homeschool: Letting Go of the Pinterest-Perfect and Instagram-Ideal Homeschool! This summer let us celebrate simple, spiritually refresh, and unplug even for a bit…refresh, renew, and refocus. Make sure to follow along on Facebook, Instagram, or sign up for our newsletter! Available August 3rd on Amazon! I have been praying and working on this book for months. I wholeheartedly believe in the message and can not wait to share it with you all! With all of the “internet ideal” out there these days, it is easy to start conforming and sometimes we don’t even realize it! I want to be transformed by God and not conforming to worldly patterns. I also long for the day where women hold each other up, stop comparing, and start walking together, hand-in-hand with God leading us all. When we are real with each other, we are free to have relationships, not based on superficiality, but on genuine and authentic principles. Let’s be real. Together. It’s a beautiful picture. The book will be available for Kindle or in paperback! Look for it August 3rd! Share this post with your homeschooling community! Let’s make being “real” contagious! I spent many of our early years in our homeschool searching for the BEST curriculum or the best method of homeschooling. When those catalogs arrived in the mail, I was like a kid in a candy store! I’d pore over them for hours, dog-earing the pages, highlighting my favorites, and making my wishlist. I’d spend even more time on the internet, comparing all of the best products out there, reading all of the reviews, and “shopping” endlessly for items, without hitting “purchase.” I would put items in the cart, remove them, and go through this seemingly endless cycle of searching for the be-all-end-all. I have learned over the years, the perfect homeschool curriculum is the one that works for you. Once you find something that is working, STICK with it. Do not even look for anything else! It may take a few tries in the early years of homeschooling to find what is a good fit for each child, but once you do…do not, I repeat DO NOT, look elsewhere. We have used much of the same things for years, and for those subjects, I do not even entertain the idea of using something else. Because the truth is, there is always something better out there. All of the curriculum these days is wonderful, and if we are in the pursuit of the “perfect” one, we will never move forward. We’ve had years where we have switched things up and have tweaked our methods a bit. For instance the year we used the Bible as our main textbook, we used practically no formal curriculum! And it was a great year at that. Read more about it here. Then there have been years where I have had to let our more casual methods get a bit more formal as the children grew older. So while the needs change and the situations change, change with them, but do not let the pursuit of the best hinder you. Curriculum shopping can be overwhelming. As I always say, think back to those pioneer homeschoolers of 30 years ago- they probably had access to ONE curriculum…and they succeeded. Don’t limit God. He will work no matter what you end up choosing if you are putting HIM first in all. Seek Him and pray over your choice and trust Him to lead you in His perfect plan. Those pioneer homeschoolers succeeded with a vision and a strong reliance on God, and because of them, we are here today. God worked immeasurably more than anyone could have imagined, through them…and their one curriculum. Back to School Encouragement coming in August! What if we didn’t raise a “veggie tales” generation? What if we didn’t turn God’s word into a talking tomato and cucumber but instead taught them the magnificence of God’s Word early on? I wonder if when we reduce God’s Word to silly songs and cartoon stories trying to connect with our kids, if we are really doing God any justice? Are we underestimating Him? I mean, God made our children and I think we shouldn’t underestimate their ability to understand Him and His power to reveal Himself. What if we talked to our children from early on in all seriousness about God’s Word? What if we made it as big and powerful and majestic as it is? So they’re in awe every time they opened it? What if we taught them from early on who God really is, without trying to water Him down to their level? We don’t need to make Him relatable. I think He does that quite well on his own. Perhaps in raising a Bible cartoon generation we have just taught our children that God’s Word is just an entertaining story with some songs, and maybe, just maybe, they don’t connect it with being powerful, alive, and active? So that when the going gets tough and they really need God as they grow, they may not call on Him – because cartoons aren’t very trustworthy. It’s pretty hard to have awe and wonder for a talking tomato. What if, just what if…we let God be God. And He is mighty and powerful and awesome. What if we taught our kids the truth about Him, so that they may all be in awe of Him and who He is? Then and maybe then, we would raise a next generation truly seeking Him, bowing down to Him, and following Him…because most adults aren’t going to follow a cartoon or worship one. We need to be teaching God as God from the earliest years on…so that those little ones will become adults on fire for Him…with a knowledge of a holy God that is far more powerful than we can imagine. During the school year, every morning we study the Bible together first. We have been going through a book at a time and we tie it in with our history and geography lessons. God always teaches us so much! You can read more about how we even used the Bible as our main textbook for a whole year —->here. So far we have studied the Gospels, Acts, Romans, and half of 1 Corinthians. We have truly been taught by God and we love it. Since we are now finished with formal school work for a bit and our schedule is much more relaxed, our Bible study has changed a bit too. I still make it a priority in the morning, that we sit down together and read the Word and pray. However, it looks a bit different than our usual study. All of my kids are taught that they should read their Bible first thing in the morning. This is a habit I instilled in myself years ago- that nothing goes before my eyes until I’ve read His Word. Not emails, facebook, or other words, until I have spent time in His Word. I am hoping to instill this in my kids. So now, each morning, at some point after breakfast, we all get together and discuss what each child has read in their personal Bible time that morning. It has been a very rich time! Even without a “formal” Bible study, we are still in His Word in a whole new way. The Lord is teaching us all on different levels. He will teach us through His Word no matter what. I love our time together. Rather than all study the same book together, we are getting snippets from each book through each child. The discussions have been beautiful and we are still learning so much. I thank the Lord for this time! I, myself have promised to read more of His Word this summer and more real books and spend less time in a virtual world. Sitting out on the porch while the birds sing reading CS Lewis has been the remedy I have needed for a tired soul. It was a busy Springtime! I love the time I have been spending lately in the Word. I can only hope my children become lovers of this great book as much as I do! Currently in the Bible, the book of Haggai. I can’t get enough of this little book which is teaching me so much about my relationship with the Lord. 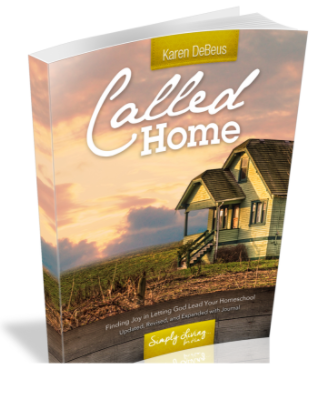 Join thousands of homeschooling families who have read Called Home and Simply Homeschool and be encouraged! Read about our experiment using the Bible as our main textbook for one year in my FREE book! New Book coming this Summer! Child of God. Saved by His Blood. A New Creation in Christ. I realize all too much lately, how there are wars over the ocean and wars right here a home—culture wars…conservative vs. liberal, right vs. left, and mom vs. mom. We all have our labels that we proudly defend. I am a disciple of Christ. I follow Him. Yes, we homeschool and I am an advocate of homeschooling, but may nothing define me more than being a child of God. So, let’s drop the labels. Let’s drop the identity crisis. Let’s remember our true identity is in Him alone. We do so many things each day- we mother, we school, we work, we are a wife, but our true purpose comes from being a child of the King first. We do those things as disciples. When we walk as a daughter of the King, we can fulfill all of those other purposes. But they don’t come first. They don’t define us. HE does. Let’s remember that we are homeschooling because that is part of what He has called us to do. To disciple the next generation. It is about SO much more than what we see online—it is a calling to raise our next generation for Him. Let us not lose sight of the main goals! So, let’s remember that when people get to know us, let us be known for HIS love. Let us be known for HIS grace. HIS mercy. Let’s stop screaming so loud about what WE DO, and start screaming about WHO HE IS. Join Me This Summer- The Simply Living for Him Retreat! At the Beautiful Lodges at Gettysburg, Gettysburg, PA. Grab your girlfriends for a ladies getaway!! We will learn all about simplifying, clearing out clutter and distractions, and having more JOY and JESUS! Do They Know You’ve Been With Jesus? This morning I read Acts 4 in my Bible. I couldn’t help but get stuck on verse 13. Do people see that I’ve been with Jesus? Do I have to tell them nothing about Jesus with my words, but they can get a glimpse of Him through me? Do they know? As I thought more and more…conviction came upon me. Do my kids know? When they see Mommy, do they see Him? If I am yelling, angry, bitter, complaining, worried...are they seeing Jesus? We want others to know…to see Him…in us. And that doesn’t happen if we aren’t spending time with Him. So, we must spend time with Him…every morning…every moment really. And that is what our focus will be this summer...the books are getting put away, and the schedule is loosening a bit…and we are going to really focus on being with Jesus. And then…He can use us…just ordinary us…to show others….Himself. Homeschooling multiple ages isn’t a new concept. Since before the modern day public school, there were moms who taught their children at home or sent them to a one-room school house. It is actually a quite natural way to learn, and if we look at it with our traditional public schooling perspective taken out the equation, we can see why. The easiest way to make homeschooling with multiple ages work is to combine as many subjects as you can together. For years, all of my children have done science, history, nature studies, art studies, read alouds, and geography together. We read a ton of living books(for most subjects) and I choose a wide variety of levels. It always amazes me how much the younger ones retain and learn. I also realize that my older ones never feel too “old” for a picture book! For science, we have always used a curriculum that is designed for multiple ages. I give assignments on what we are learning based on each level, but the “meat” of the lessons are all done together. As my children are growing, I have had to let my oldest do more independent work. She does, however, miss working with her siblings! My children have always worked together in many subjects and it is a great way for relationship building. The older ones can help the younger ones, and the younger ones can learn from the older ones. It is a way to learn to work with others and not just people the same age as us. As my older children grew older, they became able to help with much of the school work, and not necessarily because it lightened my load (although that is a perk!) but because they were learning to mentor others and how to help and teach younger ones. The little ones are learning so much from big brother and big sister. They are also fostering a relationship that definitely comes from living a homeschooling lifestyle. I see my little guy look up to his big brother so much- he adores him. It’s his best bro. 😉 I love the relationships that have been formed because they work together every day in some capacity. One of the lessons I learned early on in our journey was how to divide my time appropriately. After our “together” work was complete, the children would work on individual work. Each child had work for their level in math and language arts. In the beginning, I would have everyone work on math at the same time, as I tried to go back and forth between everyone trying to help. It was distracting for me and for them. Until one day, I set the new format that we have used ever since. I work with the very youngest first on individual work and then I work my way up to the oldest. The key is though, that each child gets individual time with me. The youngest child will always need me most because there is much more “teaching” involved, especially if they are not yet a reader, so they would go first. While I work with that child, the older ones begin their work. They are to do as much as they can without me. If they finish and it isn’t their turn to work with me yet, the rule is to wait quietly…they can find something fun to do or color, read, etc. But they must NOT interrupt me. When they know that they will get a turn, the desire to interrupt me goes away. They each can expect alone time with mommy so they don’t all feel like they have to fight for it. This has really made all the difference for many years. I am not trying to juggle each child at the same time. I generally spend anywhere from 20-40 minutes with each child individually. Is it always perfect? No. Like anything, there are definite struggles. Kids fight. Sometimes a child struggles and needs me more than usual, meaning I have to juggle times. Yet, I think homeschooling multiple grades can be doable and efficient. I wouldn’t have it any other way! The benefits of this lifestyle certainly have outweighed any of the cons. Do you homeschool multiple ages? How do you make it work? Sometimes life teaches us more than any book. That has been the case here lately, but I am embracing it- because after all, we are teaching our children to be prepared for real life and not just a test. It’s been a busy few months here with travelling and other life events, so we haven’t had all of our traditional studies taught the traditional way, but I think we have learned even more than any textbook could have taught. I just love homeschooling and more and more I see it works. We are learning so much without a traditional textbook many days. For us, the real life learning trumps a list of facts any day. The life lessons are the true lessons. Most of all, we use our daily life to center around God, focus on His word and what He says about the situations we are in or what we are learning. That is the most important thing I want my children to learn each day. When faced with a situation, “What does God’s Word say about that?” is the first thing I want them to know. I am embracing the fact that our unique homeschool is just that- unique to our family. We are teaching the way I feel God has led us. There is so much freedom and joy in knowing we are walking the path He called us to and following Him.